UMF dining services serves 25 percent local foods. University of Maine at Farmington students sitting down for lunch can now be assured of the freshest, locally sourced, Gulf of Maine white fish on their plates. 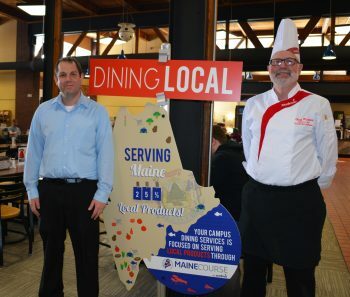 According to the Portland Press Herald, Sodexo, the University’s dining services since 2016, is meeting the promised goal of 100 percent locally sourced white fish. The goal is part of The Maine Course program, a statewide initiative to serve local and sustainably harvested food. UMF pledged to commit to locally sourcing (within 175 miles of campus) 20 percent of its food by 2020, but has already exceeded that goal and is currently sourcing 25 percent of its food locally. By making serving more local foods a priority, the effort helps boost the Maine economy and reduce the university’s environmental footprint.